“Opa!,” the waiter yells as he sprays lemon over the cheese appetizer. A huge flame emerges in front of the eyes of the customers. “Opa!,” the restaurant responds back. 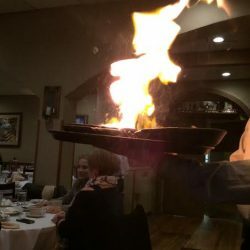 Psistaria, the name many can’t pronounce, is a popular and authentic Greek restaurant located at 4711 West Touhy Avenue in Lincolnwood. This delicious Greek appetizer called, “saganaki” or better known as”flaming cheese,” is an appetizer favorite and is a traditional Greek meal starter. For appetizers most start with bread (obviously) and a bowl of traditional egg lemon soup. This of course is served with flaming cheese as well. After only appetizers, your stomach will already be full. The flaming cheese “saganaki” from Psistaria. The service at Psistaria was great. Your water cup will never be empty because they refill your glass constantly. My only suggestion would be to go before 5:00 p.m. if you are going to eat there — if you go any later, you won’t get a table because it gets so crowded. Although I’ve been there many times throughout my life, I always end up getting the same thing at Psistaria for a main course. I always decide to get either the gyros sandwich (lamb, or beef in pita) or shish kebabs with pork. The dishes come with so much food, you could definitely say they use Greek portion sizes. Each dish comes with a pita, tzatziki sauce, tomatoes, onions and more bread. Those who order the Pastichio dish devour it, so I’ll definitely be making a note of that for next time. This dish consists of pasta and meat compacted together into a square shape. It looks delicious, and the bite I stole was delicious, too. Many people love Psistaria’s food and service and say it becomes a place where their whole family can bond while eating a delicious Greek meal. “Psistaria is my family’s go-to place for lunch or dinner. We love everything about the restaurant, from the food to the friendly people. My favorite dish from there would definitely be the Agean Garidomacaronda, which is basically a shrimp pasta with a variety of vegetables. 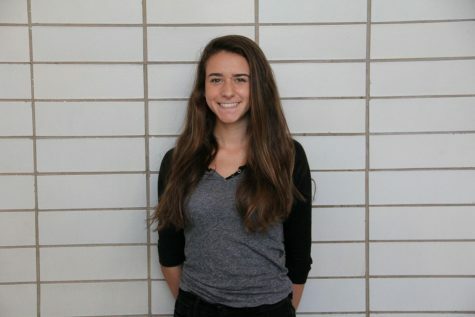 Whenever I go there with my father, we always end up getting the baklava (dessert) and it is the perfect ending to an amazing meal,” sophomore Amela Duskic said. All the food was delicious, no complaints. Usually when in Greece, everyone ends a meal with sweets and coffee. Usually I’m too full to eat any dessert, but when I do, the Ekmek with ice cream melts in my mouth and is worth the extremely full stomach that comes afterwards. I 100 percent recommend Psistaria to anyone who loves Greek food or anyone who is really hungry and wanting to try something new. I can guarantee you will not be hungry when you leave.